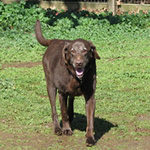 Bear had a fabulous time at Camp Four Paws. We are so pleased to have found a place that we can take Bear. The pictures of him socializing with other dogs says it all. The facility you have is fantastic, and is so much more than we ever expected. You truly enjoy what you do, and it shows by what you have to offer. Thank you so much. Bear looks forward to visiting again!!! I have moved all over California due to my job and have boarded my dog in so many places I've lost count. My dog has never come home so normal and happy FROM ANYWHERE else. This is a great place for my dog. I can tell it really worked for him. Geez, what am I going to do if I have to leave Clayton. *&^%# Thank you Niki and Troy for all your attention and bike riding. It really paid off for him! 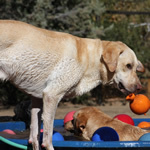 Just wanted to share with others how much our English Labrador, Angel, loves Camp 4 Paws!!!! She has had 4 stays already and is getting ready for her longest visit in September. Each time we bring her, she gets so excited as we make that turn onto Morgan Territory Rd. It is like she knows she is coming to camp. Once she sees her friends, she wants nothing to do with us anymore. Thank you for taking such great care of our Angel. We love the pictures too! I think Angel does as well! Thanks to Troy and the staff at Camp 4 Paws, you are great!!!!!!!!!!! 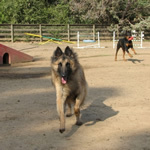 Our Belgian Tervuren, Nikki, said the happiest place on earth is NOT Disneyland, it is Camp Four Paws! He loved his time at camp, and for the first time in his life, got the exercise and socialization he needed.He came home calmer,happier, and even seemed to have acquired a few manners!The huge,open playing fields are exactly what a city boy needs. Nikki's counselors obviously treated him with lots of love and attention. 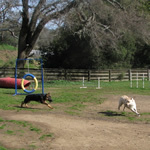 Camp Four Paws is well maintained, very clean,and the staff is wonderful. You had better believe that Nikki will be back!